This page may look like an ordinary webpage, but rest assured, there’s nothing normal about it. It’s much more than that – it’s a key. It’s a green light. It’s permission to play a lottery game the way you want. Because this is Carolina Pick 4. Here, you can fully customize how you play for the chance to win $5,000 in two daily drawings. First, pick four numbers from 0 to 9, and how many times you want to play. Then choose a play style – are you the type who alphabetizes your cereal? Exact is your game. Are you one of those people who justifies mixing two different foods on a plate together because “it all goes to the same place”? Then Combo is for you. If you took more than two math classes in school on purpose, then you may consider adding 1-OFF for an extra 80 ways to win. How you want to play is totally up to you. And there’s nothing ordinary about that. Say hello to Pick 4. How do you want to play? Pick four numbers from 0 to 9. Select the drawing time you want to play. Choose day draw (approx. 3 p.m.) to play daytime draws only. Choose evening draw (approx. 11:22 p.m.) to play evening draws only. Choose both draws to, you guessed it, play the next available day and evening draws. Two separate Pick 4 tickets will be generated: one for daytime drawings and one for evening drawings. 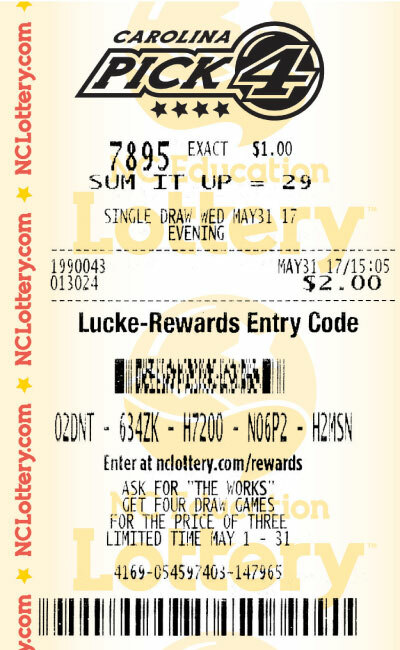 Your Carolina Pick 4 ticket can be canceled by the retailer on the terminal where it was produced within 15 minutes of the purchase time or within the remaining time before the draw break, whichever occurs first. The Pick 4 top prize is won by matching all 4 winning numbers in the exact order drawn. For example, let’s say you play Carolina Pick 4 and select the numbers 7-8-9-5. The sum of those numbers is 29. Then, if the numbers 6-9-5-9 are drawn, you win the Sum + It + Up prize because 6+9+5+9=29. You do not have to match the Pick 4 drawing numbers to win on the Sum + It + Up feature. 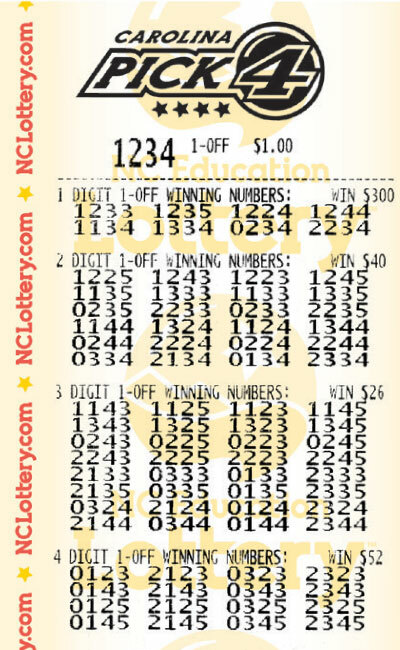 Select your four numbers for your Carolina Pick 4 ticket and a play type. Mark Sum + It + Up on each panel where you want to add Sum + It + Up to. Each addition of Sum + It + Up will cost an additional 50¢ when added to a 50¢ Pick 4 play and $1.00 for a $1.00 Pick 4 play. The top Sum + It + Up prize of $5,000 can only be won by playing 0-0-0-0 or 9-9-9-9 for $1.00, adding Sum + It + Up for an additional $1.00, and matching the sum of the numbers drawn. Odds vary based on the numbers played. Odds of winning SUM IT UP range from 1 in 15 to 1 in 10,000. 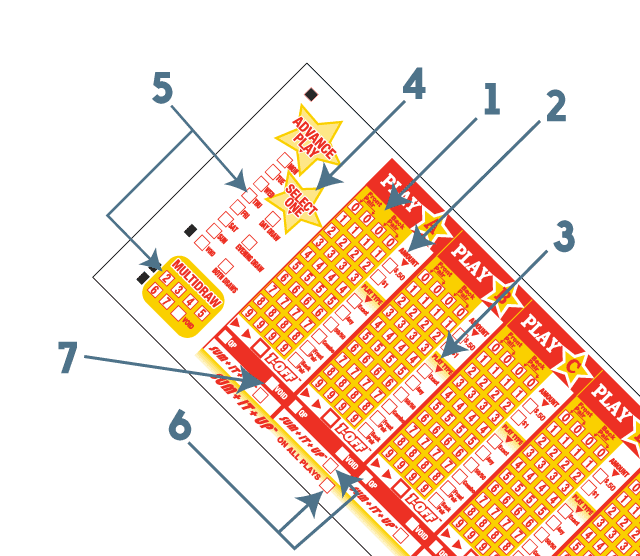 After you pick your 4 numbers on your Pick 4 ticket, select the 1-OFF play type. Only one play type may be selected per panel. Pick 4 with 1-OFF gives you 80 CHANCES to win based on numbers selected.